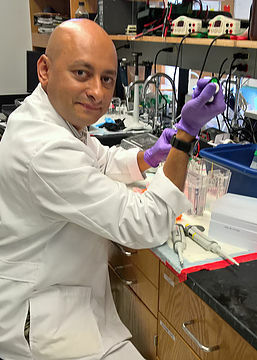 BHD Researcher Interview: Dr Mehdi Mollapour is an assistant professor and Head of the Renal Cancer Biology Section at the SUNY Upstate Medical University in Syracuse. Dr Mellapour is interested in the interaction of folliculin with heat-sensitive proteins and associated roles in kidney tumourigenesis. It all began when Dr Baba presented his data during the branch seminar at Urologic Oncology Branch at National Cancer Institute in Bethesda, USA in 2008. We were both research fellows at that time, and he showed his data on the discovery of FNIPs that was published with Dr Laura Schmidt and Dr W. Marston Linehan (Chief of the Urologic Oncology Branch). I think on his third or fourth slide, he showed the FNIP1 interaction with Hsp90 molecular chaperone. This was very exciting, because of my background in the chaperone field. My group at the Department of Urology, Upstate Medical University, USA has recently discovered a new function for FNIP1 and FNIP2 as new co-chaperones of Hsp90. We are currently working on the mechanisms of post-translational modifications of FNIP1 and FNIP2 and how this impacts their binding to Hsp90. We are also working on understanding and dissecting the function of FLCN. Tissue array. I think this would be beneficial to the field. At the risk of sounding bias, the findings with the FNIPs knockout mice reported by Drs Schmidt and Linehan is very interesting and can potentially provide molecular targets for the development of novel therapeutics for kidney cancer. In the BHD field, the Baba et al, 2006 PNAS paper reporting the discovery of FNIPs. This is a very elegant piece of work. Non-BHD paper has to be the DNA structure paper by Watson and Crick. This may sound like an old cliche but read this paper very carefully. The first line of this paper states; “We wish to suggest a structure for the salt of DNA”. Keep on reading the rest of the paper because it gets more interesting. Decipher the function of FLCN. It is very difficult to predict how this field is going to develop or progress even in 5 years. But I really hope at least we address one or both of these questions; 1) Why tumors occur in BHD patients? 2) Developing strategies for treating BHD syndrome. Book- 1984 by George Orwell. Film- Once Upon a Time in America by Sergio Leone. Great movie, amazing soundtrack by Ennio Morricone and a fantastic cast. Probably follow in my father’s footsteps and become a film director. Doing the same thing as I am doing right now because it gets me out of bed every morning and it excites me everyday. “Keep it simple” and my favourite “Illegitimi non carborundum”. Sir John Skehel. His group solved the crystal structure of haemogglutinin of influenza virus in 1981. Long after that, I did Masters research at the National Institute for Medical Research in UK while he was the director of this institute. He was very generous, kind, helpful to me but above all he is humble. BHD Personal Story: Wendy is from New Zealand and was diagnosed with BHD in 2014. First received diagnosis in 2014. I had been having spontaneous pneumothoraces since I was 13. Also many other family members have had them as well. Somewhat upsetting – particularly knowing that I had no doubt passed it onto my children. Yes, most have been tested now. It has raised concern that perhaps this is something that could/should be removed genetically in future generations of our family. Initially the Genetic Councillor then the internet. Get health insurance before being tested. It is harder if not impossible to get insurance with this diagnosis. When I first had children not many people in our immediate family had had the collapsed lungs. However, 3 cousins have had them in the last few years and everyone who has been tested has had a positive test. This means my children almost certainly will have it. I feel terrible as it has ruined my life and I live with pain every day from all my operations. I hate knowing that I have probably passed this curse onto them. Be empathetic. Even though you look normal on the outside it doesn’t mean you feel good. Also there are ups and downs. The doctors have very unrealistic recovery information. It took me 3 months of bed rest after my last thoracotomy to start to recover and then 2 more years to feel slightly good again. It is depressing. Quite good at the moment. I get very light headed if I have to bend down and squash my lungs up – e.g. weeding garden, tying shoes. Occasional stabbing pains. Nerve pain across from lower rib cage. Sore lungs if I laugh too much or exert myself (the following day) and a feeling of vulnerability. I had to take the morning after pill a few months ago and I got a small collapse from it (one of my operations didn’t result in a complete fusion of lung to chest cavity, so the part that didn’t adhere came down again). No treatment. However I have found through trial and error that if I eat gluten and nightshade-free my pain levels are dramatically reduced (I had received positive allergy tests for both). I think I contacted the doctor that had tested our family in the 90s and he put me onto new testing. I can’t properly remember. They don’t have a very good understanding of this condition. I had a great respiratory specialist that was always looking for new information, however he has since retired. I have been turned away many many times with collapsed lungs after X-rays have been inconclusive. After weeks sitting home in deep depression and pain a very bad collapsed lung was finally diagnosed with CT scan. There needs to be better testing – X-rays don’t show up if you have had previous surgeries and thickened pleura. Yes – no one will insure me. I had surgical cover with preexisting collapsed lungs before I got diagnosed so I will keep that up forever. I hope there will be a genetic test or some way to remove the gene in embryos so future generations can have it removed and won’t have to go through what I have had to. Be sensible with your health. Don’t smoke or scuba dive. If you have a suspected collapsed lung make sure you are taken seriously and not sent home until the possibility has been extensively investigated.